One weekend, my friend brought me to a so-called ‘floating market’ outside of Bangkok. It’s called Bang Nampheung Floating Market located in Samut Prakan province near Bangkok. Although the name is ‘floating’ market, but the market is actually on land. If you decided to come here, don’t expect to be shopping on boat. However, there is a river next to market that visitors can rent a boat for a joy ride, but I don’t see the point of doing so. 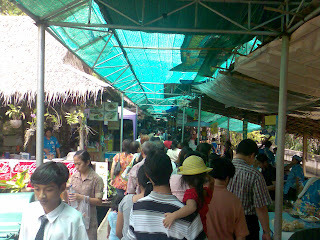 This floating market is crowded with local visitors. I also saw a handful of foreign tourists. I am not sure what they think about the market. To me, the market is interesting to me because of the variety of food that is available here. Majority of the stalls here sell food. Only a few that sell souvenirs and other merchandise. There are plenty of noodle stalls along the river. The sellers set up their stalls on a boat parked on the side. I guess that makes the market somewhat ‘floating’?? Anyway, yes, food always attracts me. Unfortunately, I didn’t get to try too many because I came here unplanned and I had lunch before I came. Darn it!! Next time I must come with an empty stomach!! 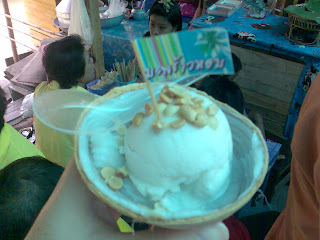 However, I still get to try coconut ice cream. It must be famous because I saw many people were eating it. It was placed in an empty coconut shell. I think that is a clever green idea to make use of the unwanted. 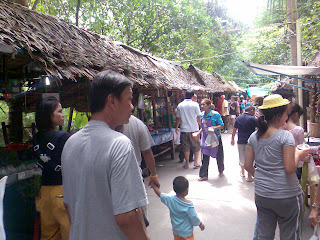 Beside the floating market is a coconut plantation. 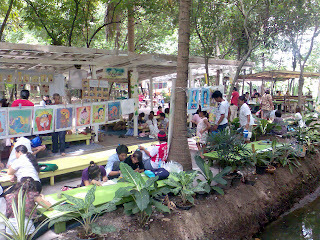 There is an area of art activities for children. Overall, this is a good place for Bangkok people to get away from the city for a few hours in the weekend. 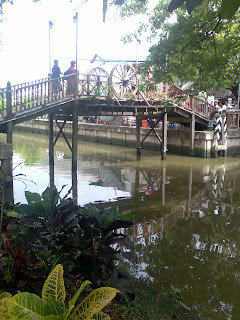 For tourists, I recommend Damnuan Saduak Floating Market. 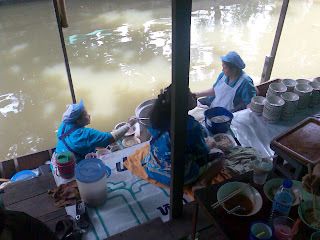 Watch out for another posting on Damnuan Saduak Floating Market. I'm sure the other floating market looks more like a floating market. Anyway I might be going to Bangkok in Nov. probably then you can bring me there.